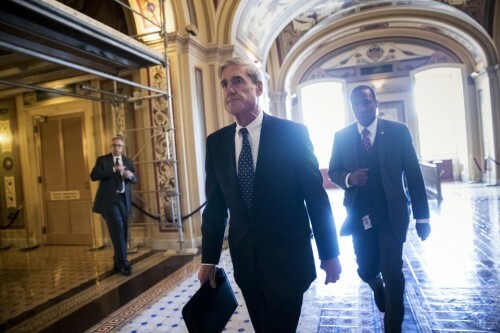 Robert Mueller, the FBI director who leads the investigation regarding Russian collusion in the last presidential election in the US, is a fascinating figure for me. He is a figure beyond reproach. His loyalty is not determined by party lines. Interestingly, his clothes reflect this dignity. It’s hard not to notice Robert Mueller if you have an eye for clothing. In a town full of bad suits and ugly ties, Mueller is one of the only people in Washington who knows how to wear a coat-and-tie. His look is quintessentially American. Soft shouldered suits with naturally rounded sleeveheads, worn over white button-down collars and tastefully selected foulard ties. All the details are middle-of-the-road, but they’re so perfectly executed that they come together in a classic American way you rarely see anymore. The analysis goes deeper into Mueller's watch. Mueller does have some personal style quirks. For one, all his shirts look to be heavily starched, such that his collar occasionally bulges in unusual ways (Eric Twardzik recently wrote about this at Ivy Style). Mueller also favors dressier pinpoint oxfords, rather than the heavier, more textured variety. And lastly, he’s almost never pictured without a chunky Casio watch on his left wrist (always with the watch facing in). It looks to be some variation of the DW-290, a classic pre-G Shock model, which Tom Cruise wore in 1996 action spy film Mission Impossible. Troy Patterson at The New Yorker calls him a "style icon." Here's a short mini-documentary by CNN.